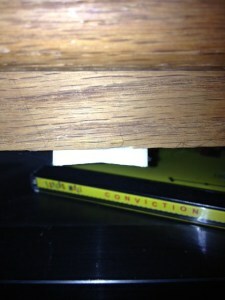 I glance up and notice the little plastic clasp screwed into the underside of the shelf of our TV stand. The pointy part, that stuck into the clasp and prevented the door from being opened without extreme intellectual and physical effort, has long since been removed. Not so the memories of putting it on in the first place, which my wife and I did around the same time we added the gadgets to every cabinet door in our apartment above the library, plugged plastic shields into all the outlets, stuck soft protectors on every furniture corner we owned, and generally ensured everything was as safe as possible for the imminent arrival of the child that turned out to be our son. Long before he thought or even knew about crawling, we had done everything we could think of to protect him from any dangers we could imagine. As our children grow up, of course, we continually and deliberately work to ensure they can eventually take care of themselves. It may be bittersweet at times, but if our true goal is that our kids grow up to be happy and confident, balancing self-reliance and connectedness, we really have no choice. Yet, the same instinct that leads us to prepare our apartments months ahead of when we really need to is never far from the surface, as my parents periodically remind me whenever my brothers, my sisters, or I are going through hard times in one way or another. As parents of Seniors are all too well aware, this is the week when all colleges that have not already announced their decision send out notifications. Peter Gow, the college counselor at Beaver Country Day School, captures the feeling perfectly in a blog entry entitled "College Admissions: Agony, Ecstasy, Reality" when he writes, "For the students... the moment of opening the letter, popping open the email, or logging into the decision site is probably as charged an event as they have experienced: a moment of truth. (...) Many see their entire futures, as well as their self-concepts, riding on the decision made by the admission committee at some beloved college, and some will take “bad news”—denial or waitlist or even January admission—as a personal blow." You see your kids grow up into these amazing people, and suddenly a decision taken by total strangers hundreds of miles away, often made of necessity on the basis of about five minutes' worth of discussion, has the potential to devastate them with just a single word. As we envision such a moment, little plastic clasps, shields, and corner protectors are utterly pointless. All we have is our intense love for and faith in our kids to try and help them pull through the week. Peter keeps tissue boxes close at hand during this week, and no doubt day parents do too. But as boarding parents, you can't even offer a Kleenex, never mind wrap your kid in a hug. On the other hand, what stronger ally than our love for and faith in our kids? Whether communicated in a glance, a quick squeeze of the shoulder, a back rub, or via words spoken softly between longer pauses or thumbed with a sort of desperate urgency into a text window, our ability to reaffirm all those wonderful qualities we see in our kids and to let them know we love them can at least lay the groundwork for the decisions that will eventually settle out. Peter captures this well, too, when he notes that "college counselors, like teachers, administrators, parents, friends, and the world at large spend this week above all other weeks in the year helping kids understand that it’s not about rejection or acceptance but about making the most of the opportunities life gives us." In talking to students and parents, to Andy Patt in years past, to Lauren in more recent years, as well as to my brother-in-law who is a college counselor at Thayer, I knowhow deeply important the role of a school is in providing their own support. As a seventh grader once said, "Tell me what you really think about my story. My parents liked it... but they have to!" In our own knowledge of kids, with that peculiar blend of love and objectivity that a teacher brings a student, we can and do perform our part in helping kids work through the agony and the ecstasy of this week. Here, too, I feel lucky as my son's house counselor (his school's word for "houseparent") wrote all of us parents early in the week to gently prepare us for what we thought we knew was coming, and to tell us she would be always open to the kids telling whatever news they chose to share and seeking whatever support they felt they needed but that she would not be forcing the issue. And though he may not have written us, I trust my son's college counselor to do the same. I know my son well. He has a long history of making the most of the opportunities that life has brought him - and our family has been extraordinarily blessed with opportunities. We will get through this week together, he, my wife, and I. He will find the college where he was meant to be, work hard, learn, and be subtly shaped as he continues to set the direction of his life. And then one day, perhaps, his own child will await the decisions of colleges. He may talk through his feelings with us, whatever he chooses to share. And a brief glance of understanding will pass between us as we remember this week and draw on lessons learned. "The point is that the lives of eighteen-year-olds have plenty of room for change, a lesson that only experience can teach us and that I have been surprised and generally pleased to discover is taught to us recurringly over many decades." (Gow) The same, of course, is true of twelve-year-olds, thirteen-year-olds - and yes, even fifty-two-year-olds.